Everyone knows Bob Ross . He was one of the most influential TV personalities of my childhood and a shining light in the Art field. The way a painting came to life in front of your eyes, from seemingly unrelated paint strokes, was just magical. Bob is having a resurgence on the web and it is one he thoroughly deserves. 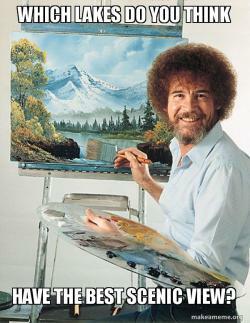 It has beena long time coming but we here at MakeaMeme are only to happy to add Bob to our set of Memes. We are sure it will become a popular one. RIP Bob we all miss you.